6.0 Marshmallow: SD card storage does not show up when connected to laptop via USB? I bought a 64 GB SD card and adopted it as internal storage. No issues with it except that when I connect the phone to my laptop via USB, only the Internal storage folder with 9.5 GB of free memory(I bought a 16 GB phone) shows up. The SD card memory does not show up so I cannot see the new folders which I created in it using my phone file manager. 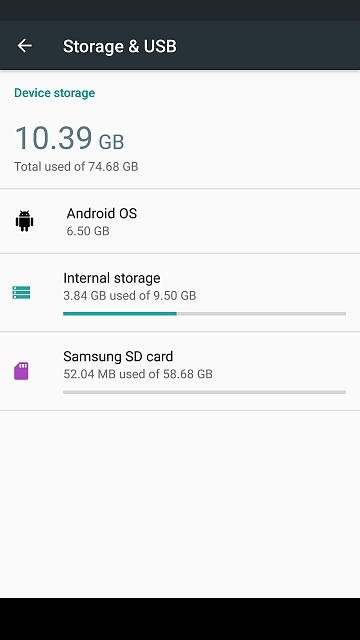 If I format the card as portable storage, will I able to transfer app data of apps like Facebook to the SD card as I was able to do in Lollipop? Another user is having the opposite problem as you after he formatted as adoptable storage: he only sees the SD card and not the internal card. The only thing that I can see that both of you have in common is the fact that you formatted as adoptable storage. So, let me ask. On your phone, if you go into storage, what does it look like? Do you see two devices, or one large piece of storage? To answer your other question, I don't think so. I just checked on my Moto X running 6.0... it has a SD card that isn't formatted as adoptable storage and I do not see any option to move any app to the SD card. My phone shows storage as below when I format the SD card as adoptable storage. My PC shows storage on the phone as below. Hmm, you also don't have many apps installed, do you? Not that this means anything... it's all just data right now for me. Having the same problem. SDcard formatted as adoptable storage but when I plug it into the computer and open the folder it is empty. Okay. I Solved this one. Migrate your data. :P That fixes the issue. I had a piddly amount of data, and thought "Pshhht.. not bothering". When I connected via usb, all I got was my nand internal storage. Then I did the migrate your data thing. Once you do that, it uses the SD card that you've designated as internal storage, to the main storage unit, and when you plug in a usb and select mtp, bingo! your sd card will appear, on its own, instead of the internal nand storage. It means your computer will no longer see the internal nand storage, but who cares? Mine is only about 9gb after all is said and done (and filled with random app crap). Ok how do you do the migrat your data thing? So if I were to get a 16gb version with a 200gb or 128gb card it will use the sd card first then the phones memory? And if I have a lot of pictures on my current phone can I move them to the moto x pure after I make the sd card internal? Thanks. So from what was said earlier about the "migrate thing". click on setting>storage and usb>sd card and in the sd card settings(the three dots on the upper right conrner it says migrate data. this will transfer all the data to the sd car. I connected the phone( lg g4-lollipop version) to my laptop bcz i wanna free some space ...i didn't find what's on sd so that i can move them to the laptop ...the only visible thing is internal storage ...u tried to unmount the sd and then mount it sais i cannot unmount it when connected to a laptop with transfer mode ..so what shall i do ...i want to free some space from sd and i cannot move them to the laptop...i tried to place l sd in a usb to the computer but i think the usb is kinda bad bcz when i wanted to move them it is unconnected maybe it's bad ...so i found non of the solutions so plz reply and help ...otherwise i will be senting them to another device by bluetooth ... So plz help ! thanks mate that migrate thing solved the problem!!! I have my sd card formatted as internal. I am able to move the apps to SD card, and have the option of migrating the data to SD card but when I manually try to select and move a particular picture to SD Card, I don't get the SD Card option. The ES file manager and File commander Apps too don't show SD Card or the added memory from it to internal memory. When I connect my phone to laptop, it is being detected as music device (icon shows) and neither internal nor external memory shows. It is absolutely blank. I It took me a longer while but i finally made my sd card work. Install SDFormatter, format it with option full (overwrite) selected. Normal format doesnt help and my card wasn't visible at any android device. It did however work on PC. Hi..I hv same problem wid my Moto x play. As I selected my SD card as internal storage BT not able to use the SD card free space so I migrate data of 7 GB from internal storage to SD card.after dat my whole device is cleaned up and my all photos videos and all files got disappeared from my device.but in storage settings SD card memory is showing dat 7 GB but while opening can't find that data.i hv installed many file managers but not able to locate that data..Nd when connecting to pc I can only see internal storage no SD card storage is visible in pc. And I also tried wid SD card reader Nd there my SD card is showing empty.bt on my phone it is still showing around 8 GB storage. Ihv lost all my important photos and docs.now my phone is all empty Plz help me out to recover these files. How to migrate data in a phone? Right, had this issue too on android 6...the Sd card or indeed android 6 just wasn't playing ball...there was no option to change storage destination, and no matter what I done, I could not figure it out. I was beggining to think that my new Sd card was corrupt, and I tried quite a few app2sd apps with no joy....so how was it solved? when formatting the sd card, it asks if you wish to write to sd by default...YES...the choose portable storage...NOT internal storage. when its all done, go to play store and install an app called "install apps on sd card-move". just tick box the apps and photos/videos and all the big files you have downloaded, and then click the sd card transfer pic up top, and it will move them to the sd card. none of the other apps are much cop, as they simply lead you to the android part of the "move/change" process which is missing... but this certainly bypassed that, and worked. I had the issue with the SD not being recognized after "adopting" it as internal storage. "Migrating" did the trick! Now it's just one big chunk of uninterrupted space. I could'a sworn I did that already. Good thing, 'cuz I was about to turn green and go all Hulk on this phone! Why am I not able to move apps to external memory after 6.0.1 update? Why my phone is getting restart whenever i am adding sim card in it?